Marvel Contest of Champions 5.1.2 APK is coming to Android. If you want to install it easily you can download the latest APK, then transfer it to your device. This game tells about contest which is organized by the Collector and they collect all Marvel superheroes like The Hulk, Spider-Man, Thor, Iron Man, and many others in the form of crystals. Well, you will participate in this contest against Kang ruler in the contest. As a first step to participate in the contest, you have to have a hero who could duel with the hero of Kang. For that, you have to open the crystal to get random hero. Once you have a hero, you are ready to run the quests which are provided. A quest will contain the search space in between the rocks to collect XP, coins, and also artifacts and fight with the enemy that awaited them. Every step that you do requires energy. The energy will be recharged within a period of 3-4 minutes. Entry into the fight, control intiutif and simple enough to be served. Tap and swipe to the right of the screen to perform an attack. Do it alternately and repeatedly will result in a combo that will increase damage. There are two kinds of special attacks that you can remove it. First, tap and hold on the right of the screen to destroy the enemy’s defense. While the second, there is a small button on the bottom left of the screen with the bar continues to fill up when you attack. By pressing the button, the most special attacks of hero you will come out. 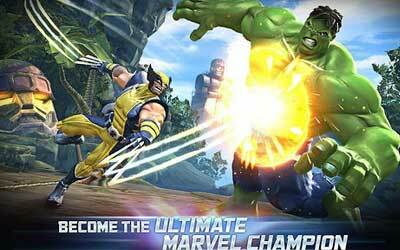 If you’re happy with indiscriminate attacks but under control, you will be very happy with Marvel Contest. HD QUALITY. 1080p for hi-def gaming experience on most Android tablets. So the game is so fun and a great way to pass time but the only problem is that the 4 star odds are so low.